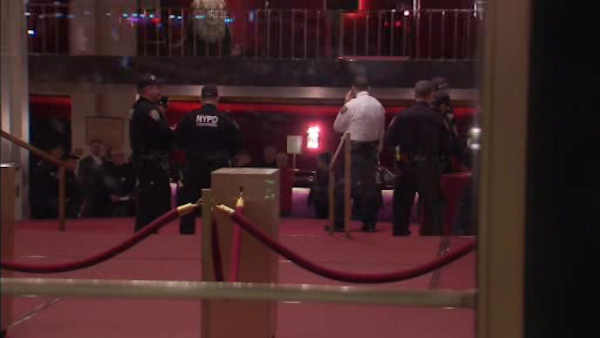 LINCOLN CENTER, Manhattan (WABC) -- A 52-year-old opera fan from Dallas has been interviewed by police after he tossed human ashes into the Metropolitan Opera orchestra pit Saturday night. The man was identified through ticket records and social media. He confirmed to police that the powder he sprinkled was the remains of his friend and mentor, also an avid opera lover. The man did not immediately face criminal charges, but authorities are still discussing whether he violated the city's health code. An investigation later determined that the powder was safe. As a safety precaution, the Met canceled the remainder of the performance of Gioachino Rossini's "William Tell" on Saturday afternoon. In addition, Saturday night's performance of 'L'Italiana in Algeri' was also canceled. Saturday's scare, which drew the city's anti-terrorism police to the nation's premier opera house, was diffused by Sunday. After conducting tests, investigators ruled out anthrax or any other dangerous substance. Nearly 4,000 spectators were quickly evacuated after the dramatic intermission incident at about 4:30 p.m.
John Miller, the New York Police Department's deputy commissioner in charge of intelligence and counterterrorism, said Saturday that the disposal of ashes at an opera house may violate city codes but "I don't believe at this point that we see any criminal intent here." He said the possibility that the substance was human ashes "is certainly an area that we are pursuing." Met General Manager Peter Gelb said people who had Saturday tickets should call the Met and make arrangements to see a later performance.